Did you read about how the media put protesters against white supremacists and neo-Nazis in danger of reprisals by the far right? No? Berkeley, we have a problem. On August 5, 2018, Berkeley witnessed another “Say No to Marxism” rally. This rally built on the momentum of a similar gathering in Portland the day before, for which organizers recruited big names in the far-right. 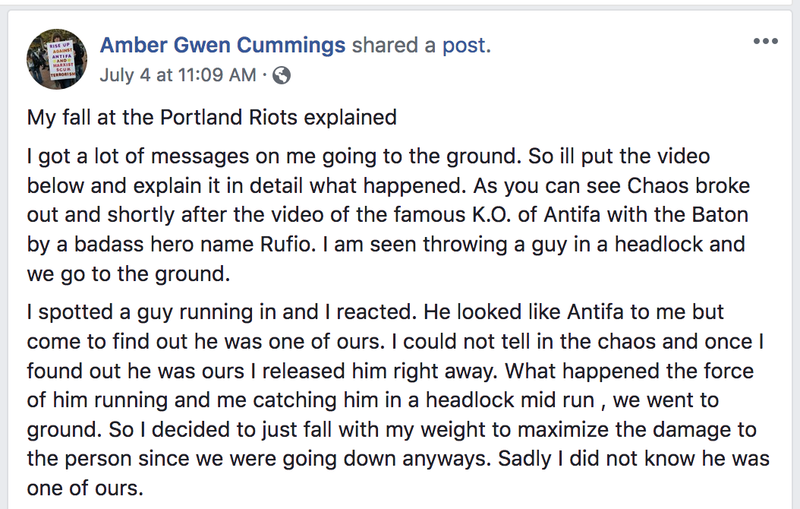 Although Amber Cummings, the Berkeley event’s main organizer, vehemently denied any association with America’s white supremacist movement, she has fought alongside them in the street – and as in Portland, some major white supremacy groups were invited to the rally, including Patriot Prayer, the Proud Boys, and American Guard. Cummings invited alt-right speakers including Bay Area Proud Boy Jeffrey Perrine, who became infamous at an earlier far-right rally where he called for immigrants’ heads to be “smashed against the concrete” and to “separate their kids.” After the event gained negative publicity, the Proud Boys’ leader, Gavin McInnes, pulled his official endorsement, and the American Guard were disinvited; but Perrine and other well-known white supremacists were still photographed at the rally. Some of those most vulnerable to alt-right attacks, including people of color and LGBTQIA folk, feel a strong need to conceal their identities from white supremacists. Like other people about whom we read far too often, they can find themselves in trouble for no reason other than simply existing while being black or brown or gay; they may have no intent to do anything to harm anyone, but may rely on masks to protect themselves from being identified and bullied or worse once the protest is over. That’s no idle fear: publicly posting the identities of counter-protestors for harassment and death threats is a common white supremacist tactic. Thus, by arresting those wearing masks, police may be endangering precisely the people who need the most protection from white supremacists. In light of this, what followed played right into the hands of the alt-right. The Berkeley Police Department tweeted the mugshots, full names, ages, and locations of those they arrested, and news outlets, including NBC Bay Area, CBS and Berkeleyside, reported their full names, ages and towns of residence – leaving vulnerable community members open to future harassment, death threats, and attacks by violent white supremacists. Regardless of whether or not the protesters committed a crime – and no one had been charged at the time of reporting! – this kind of release of information does not further justice. Rather, it puts those arrested at a serious risk of violence and harassment from the far-right, incites fear, and has a chilling effect on the number of people willing to attend future protests. This matters. We as a community need to be able to show up when our friends, loved ones, and neighbors feel threatened. We need to know that we can show strength and solidarity and stand up to bigotry without fear of being targeted. And we need to know that local publications will not publish our personal information and make it easy for the people who wish us harm to find us. Tell Berkeleyside, CBS and NBC (for CBS and NBC, please write a comment after the article) that we will not accept this dangerously negligent reporting or public shaming and that they do not represent us in their actions. My name is ______ and I’m a member of Indivisible East Bay. I am outraged by your decision to publish the names, ages, and hometowns of those arrested at the August 5 rally and march in Berkeley. Alt-right organizations like those participating in this rally have a stated policy of exposing, harassing and threatening those who oppose them; your actions endanger members of our community and further embolden the far right in their tactics of violence and intimidation. I am asking you to remove this information from your article and commit to not repeating this sort of action that directly puts lives in danger. and you injure, oppress, threaten, or intimidate anyone – whatever that means. and that should apply to everyone no matter their political beliefs (the law specifically doesn’t apply to the police, which is a whole other story). You might think this law doesn’t appeal to you, but you might be very wrong. I’ve never gone to a protest in a mask but I’ve pulled a scarf across my mouth and nose when stink bombs went off. That counts as a “mask.” And who knows but someone might hear me say something against the Current Occupant of the White House and claim that I intimidated them? Bottom line: Do you really want this government – which calls the media the enemy of the people and prosecutes non-violent people for being journalists or carrying medical supplies at protests – passing laws that by their very name are aimed at jailing protestors on the left? My name is ____, my zip code is ____ and I am a member of Indivisible East Bay. Please speak out against HR 6054, Unmasking Antifa Act of 2018. This government should not be passing unnecessary and poorly conceived laws that by their very name are aimed at protestors against white supremacists, at a time when the government is failing to take adequate action against white supremacists and supremacist organizations themselves. Please keep HR 6054 from becoming law.